More than half of the world's uranium production comes from just 10 mines. Canada, the second biggest uranium producer in the world, hosts the world's biggest - the McArthur River uranium mine - while Kazakhstan, the largest uranium producing country, operates three of the top 10. Mining-technology.com profiles the world's biggest uranium mines by production. Cameco-operated McArthur River mine in Canada is the world's biggest producing uranium mine. BHP Billiton's Olympic Dam in Australia is the second largest uranium producing mine in the world. The Ranger open-pit mine in Australia produced 3,146 tonnes of uranium in 2012. Image courtesy of Geomartin. AREVA's Arlit mining operation in Niger produced 3,065 tonnes of uranium in 2012. Image courtesy of David FRANCOIS. Tortkuduk in Kazakhstan is the largest in-situ leach (ISL) uranium mine in the world. Rio Tinto-operated Rossing uranium mine in Namibia produced 2,289 tonnes of uranium in 2012. Kraznokamensk is the biggest uranium mining operation of Russia. Paladin Energy's Langer Heinrich mine in Namibia is the tenth largest uranium producing mine in the world. McArthur River mine located about 620km north of Saskatoon, Canada, is currently the world’s largest uranium producing mine. It produced 7,520 tonnes of uranium in 2012, accounting for 13% of the world’s total uranium production. McArthur River is also considered to be the largest high-grade uranium deposit in the world. McArthur River uranium deposit was discovered in 1988 and mining began in 1999. It’s proven and probable reserves as of December 2012 were 1.05 million tonnes of ore grading 16.36% uranium. Cameco operates the mine with a working interest of 69.8%. The remaining 30.2% is owned by AREVA Resources. 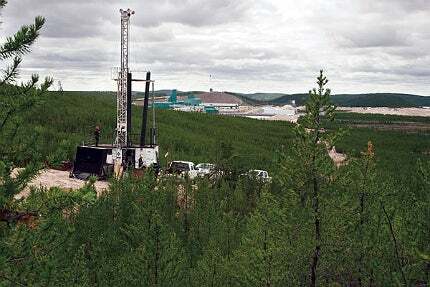 McArthur River is an underground operation using remotely operated equipment. The ore is sent to the Cameco-operated Key Lake mill for processing. The Key Lake mill located about 80km south of the mine is owned 83.3% by Cameco and 16.7% by AREVA Resources. Olympic Dam mine located near the town of Roxby Downs 560km north of Adelaide in Australia ranks as the second biggest uranium producing mine in the world. It produced 4,100t of uranium in the year ending June 2013. The mine also produces copper, silver and gold. The poly-metallic mine, wholly-owned and operated by BHP Billiton, has been in production since 1988. The proven and probable reserves of the mine were calculated at 619 million tonnes of ore grading 0.057% uranium as of June 2013. The mine’s life is estimated to be 56 years. Olympic Dam is an underground mining operation. The ore is crushed underground and treated in a copper sulphide flotation plant. Uranium minerals from the tailings and copper concentrates are recovered by acid leaching. A $28bn expansion project has been planned for Olympic Dam, which would increase the mine’s annual uranium oxide output to more than 15,000t, making it the world’s largest uranium producing mine. The expansion, however, is currently on hold. Ranger uranium mine, 260km east of Darwin in the Northern Territory of Australia, was the world’s third largest uranium producing mine in 2012 where the open-pit mine produced 3,146t of uranium during the year. The mine has been operational since 1980. Ranger mine is owned and operated by Energy Resources Australia (ERA), a subsidiary of Rio Tinto. The mine is presently in transition from open-pit mining to underground explorations. The stockpile ore from the Ranger Pit-3 is being processed. Total contained uranium reserves of the open-pit including stockpiles were estimated at 9,675t as of December 2012. Arlit uranium mining operation, on the southern border of the Sahara desert in West African country Niger, ranks as the fourth largest in the world by uranium production. The mine produced 3,065t of uranium in 2012. The Arlit mining operation comprises of several open pits exploiting four main uranium deposits, namely Arlit, Tamou, Tagora and Artois in north-western Niger. The mine is owned and operated by Société des Mines de l’Air (SOMAIR), a subsidiary of AREVA. Production started in 1971 with the mining of the Arlit deposit. The ore is processed in a plant located near the mine site, whose processing capacity was increased to 3,000t per year in 2011 with the introduction of acid heap leaching method for processing the low-grade uranium ore. The proven and probable reserve of Arlit as of December 2012 was estimated at 2.67 million tonnes of ore grading 2.64% uranium. The Arlit plant was partially damaged by a terrorist attack in May 2013. One employee died and 14 were injured in the accident. Production resumed one month later. Tortkuduk uranium mine, located about 250km north of Shimkent in Kazakhstan, is the fifth largest uranium producing mine in the world. It produced 2,661t of uranium in 2012. The Tortkuduk deposit, also known as the North Muyunkum deposit, uses in-situ leaching (ISL) to produce uranium. The mine is owned and operated by KATCO, a joint venture between AREVA (51%) and the Kazakhstan state-owned company Kazatomprom (49%). Founded in 1996, KATCO obtained permission for exploring and mining the Tortkuduk deposit along with the South Muyunkum deposit in 1999. Development of both mines was launched in 2004. Production from the Tortkuduk mine started in 2007. The ore is processed at the Tortkuduk Kazakhstan plant, whose production capacity was increased from 1,500t to 4,000t of uranium per year in 2010. KATCO’s proven and probable reserves as of December 2012 were estimated at 16.51 million tonnes of ore grading 0.75% uranium. Rio Tinto is the operator, holding 68.58% interest in the mine. Other stake holders include the Iranian Foreign Investment Company (15.29%), IDC of South Africa (10.10%), the Namibian Government (3.38%) and local share holders (2.65%). The Rossing hard-rock uranium deposits in the Namib Desert were discovered in 1928 and Rio Tinto secured mining and exploration rights in 1966. Proven and probable reserves of Rossing as of December 2012 were estimated at 131 million tonnes of ore grading 0.034% uranium. Options are being evaluated to extend the mines life beyond 2023. Kazakhstan’s Budenovskoye 2 mine, also known as the Karatau mine, is the world’s seventh largest uranium producing mine. The mine produced 2,135t of uranium in 2012. It is situated on the Budenovskoye uranium field, located 400km north-west of Shymkent in the Suzak region of South Kazakhstan province. The mine is owned and operated by Karatau, a joint venture between Kazatomprom (50%) and Uranium One (50%). The mining method employed at Budenovskoye 2 is in-situ leaching (ISL). The extracted uranium is treated at a processing facility on the site with the use of ion exchange technology. Commercial production from the Karatau uranium mine started in January 2009. The proven and probable reserves at the mine as of December 2011 were estimated at 40.7 million tonnes of ore grading 0.022% uranium. Kraznokamensk in the Krasnokamensky District of Zabaykalsky Krai in the Chita / Transbaikal region near the Sino-Russian border is the largest uranium mining operation of Russia. It is also the eighth largest in the world, having produced 2,011t of uranium in 2012. The Kraznokamensk uranium mining operation consists of six operational underground mines namely Mine 1, Mine 2, Gluboky Mine, Shakhta 6R, Mine 6 and Mine 8. Uranium production at Kraznokamensk started in 1968. The ore body at Kraznokamensk is volcanic. Langer Heinrich uranium mine, located in the Namib Desert 40km south-east of the Rio Tinto-operated Rossing uranium mine, is the ninth largest uranium producing mine in the world. The open-pit mine produced 1,960t of uranium in 2012. The mine, owned and operated by Paladin Energy, started commercial production in March 2007. Annual uranium production of the mine was increased from 1,000t to 1,430t with completion of the stage-2 expansion project of the Langer Heinrich processing plant in 2010. The stage-3 expansion project, completed in 2012, further raised the uranium production capacity to more than 2,000t. A Stage-4 expansion project has also been planned to increase uranium production capacity up to 3,850t per year. The expansion, however, will not be implemented until the uranium price increases significantly. The proven and probable reserves of Langer Heinrich including its stock piles were estimated at 108.1 million tonnes of ore grading 0.052% uranium as of June 2013. The minimum mine life at current rate of production is 20 years. South Inkai uranium mine located about 250km north-west of Shymkent in the Chu-Sarysu basin in the Suzak region of South Kazakhstan province, Kazakhstan, is the tenth largest uranium producing mine in the world. It produced 1,870t of uranium in 2012. The mine is owned and operated by Betpak Dala, joint venture between Uranium One (70%) and the state owned Kazatomprom (30%). Uranium at South Inkai is extracted through in-situ leaching (ISL). Recovered uranium is processed at a processing facility located on the site using ion exchange technology. The plant has the capacity to process 2,000t of uranium per year. Commercial production from the South Inkai uranium mine started in January 2009. The mine’s proven and probable reserves as of December 2011 were estimated at 58.1 million tonnes of ore grading 0.013% uranium.